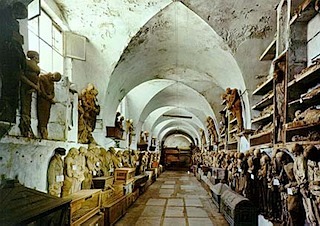 Have you read about the mummies in the catacombs of Palermo, Italy? This is an old one, but new to me. Apparently, it was a place for the burial of royalty and the socialites of that region and was maintained by monks. 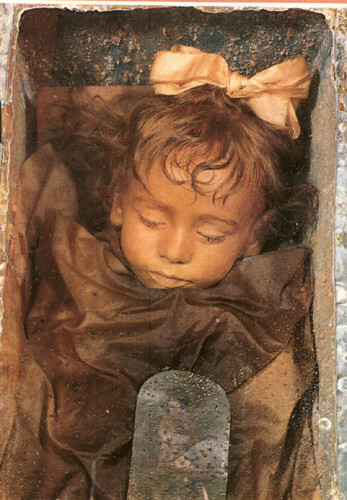 However, a 2-year girl named Rosalia was buried there in 1920 and mummified using an unknown chemical formula. Apparently, she looks nearly the same today as she did 90 years ago. Click here for the disturbing photo. I believe they stopped adding to the catacombs shortly after that.